I often find and enjoy games based on what I read from other bloggers. 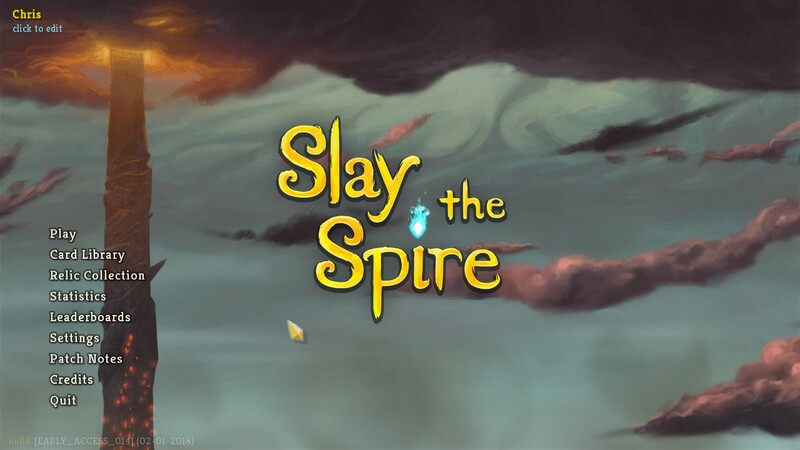 When Zubon posted about Slay the Spire, a game I already had on my “watchlist” on Steam, I bought it instantly. I had received $150 in Steam Bucks at Christmas / Birthday (same time frame) and it was burning a hole in my pocket. It didn’t take much but his recommendation to pull the trigger. Side note, KTR was the first gaming blog I really started reading and my long-winded responses to posts there is what inspired me to start this blog. So you can thank Zubon for this post AND this blog. I am using the term “thank” quite loosely, of course. Back to the spire! The game is a card based “dungeon” crawler. You pick a character, get base cards, beat enemies and experience encounters, expand and customize your deck, get items and relics to further enhance the experience, and kill bosses by climbing the spire. When you play a card from your hand, or you run out of energy to play cards, the remainder of your hand goes into discard. When you run out of cards in your pile it reshuffles in the discard pile unless the card is denoted as “exhausted” – which means it can only be played once per encounter. There are no saves and when you are dead, you are dead. There is a heavy element of randomization but after spending a good 8 hours playing it I can vouch for the learning curve and that I routinely get into the third act now (third “boss”). I will go over some basics here to try and help you see if it is something you would enjoy. First off it is early access – which is prominently displayed throughout the game as you play, to ensure there is no doubt. It has a unique art style that really grew on me and it features a bit of diversity in both the look and feel of the two available characters. 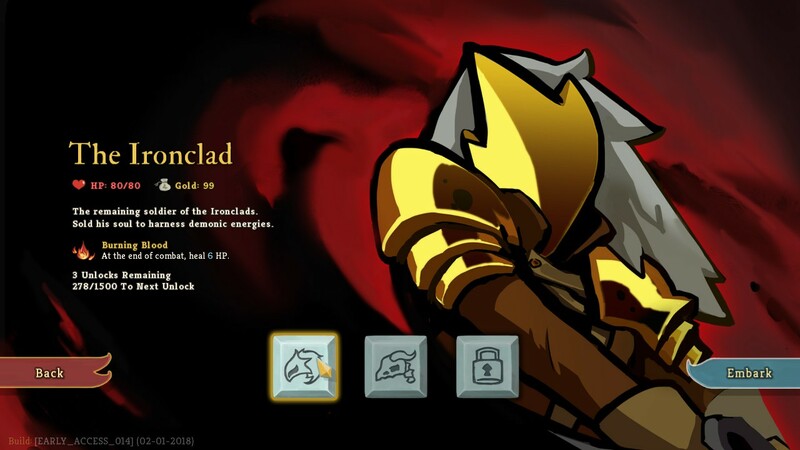 The first base character is The Ironclad – a sword wielding, heavily armored, faceless fellow. Red is the color associated with him and his deck. He has high powered solo attacks and a good base of hit points to start with. The second, is The Silent – a poison based dagger wielding lightly armored black woman. I have enjoyed her playstyle more although I have had better success with The Ironclad. These are the only two character classes available in this early access period although there is a slot for a third in the future. My hopes is they offer far more. Both play completely differently and are fun in their own right. I have played both up to the third Act. 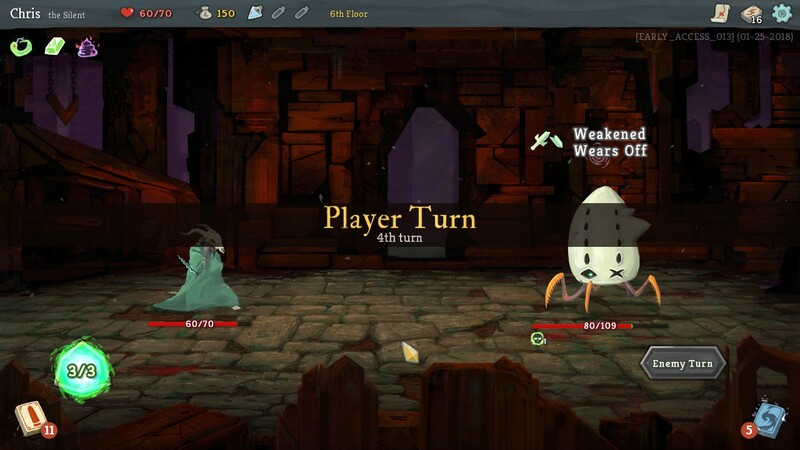 Each act is a randomized encounter system upwards through the Spire. The path is fully laid out at the onset of the game and you can plan your route with options for encounters. Standard are “Unknown” (can be anything, often quirky decision based interactions), “Merchant”, “Treasure (which gives a relic that has benefits that reoccur), “Rest” (the only in between node area you can regain up to 30% of your hit points outside of moving onto a new Act), Enemy, and Elite Enemy. I normally take routes that have options. The second fro the left branches off after two enemy encounters. If I did poorly in those fights it gives me the option to take a chance on a random encounter instead of forcing me into another battle when I am low on health. So far I have really enjoyed the varied enemies and events that I have encountered. 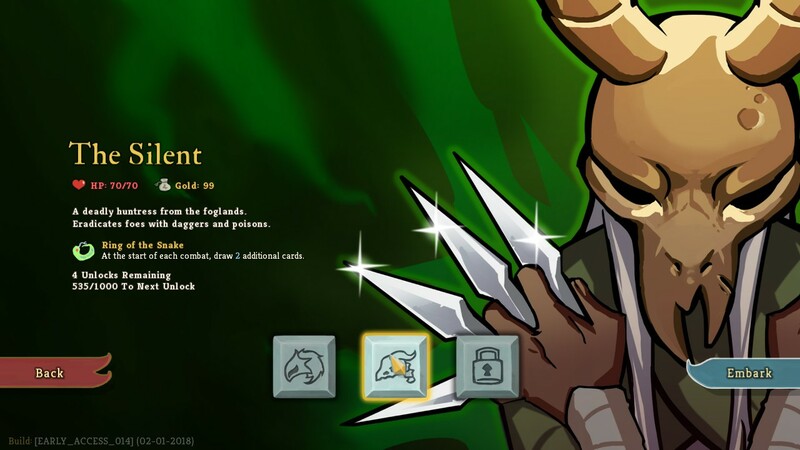 You can’t choose the easiest path and be successful – beating regular enemies rewards gold, potions, but most importantly new cards. Elite monsters give relics which can have huge impacts on your deck and gameplay – things such as “every time you are attacked deal 3 damage back” and “start each round with 2 extra energy”. Rests are important to gain health but also you can upgrade your cards instead of the health gain – if you are comfortable with how much you have. 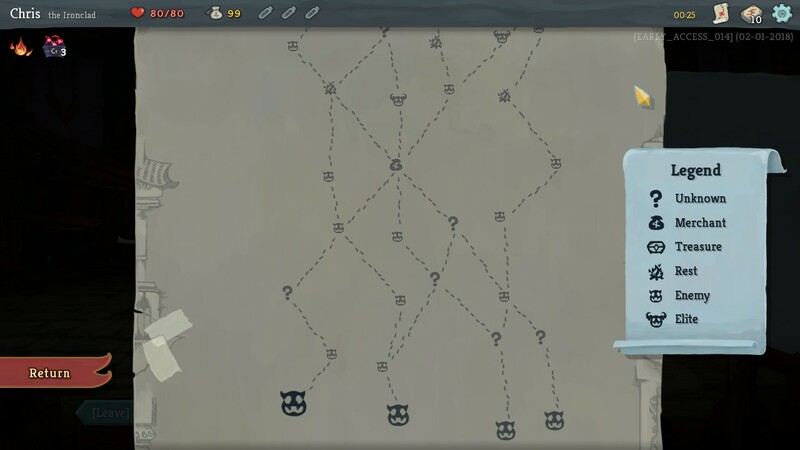 Learning the strategy around the map is something you figure out as you go. The gameplay is simple. You have cards, health, potions (found/looted/bought), gold, relics, and points you can spend cards on. You always get to go first (wonder if that will change?) although it kind of makes sense as you are climbing the spire and choosing your path, you are the one at the ready. The game helps you along by showing “intent” of the enemy. You see above the Slaver intends to attack me for 7 damage (7, red dagger) and also cast a debuff (green swirlies). My defend cards as a base defend for 5, and my Strikes for six. Here I can play two block cards to fully negate the damage (the excess of which does not carry over to subsequent rounds unless I have a card that explicitly states so) OR just kill him so he can’t attack. Obviously the kill is the easy choice. The balance is choosing how much personal health to exchange for how much damage given. The trick is balancing multiple enemies and their “intent”. Different enemies require different strategies and there are a ton of different ways to play both characters in game. It is a wonderful game in itself just discovering different strategies. And often, with the right choices and luck you get some pretty crazy builds and status options. With The Ironclad for me on my best run to date I had a lot of things line up. 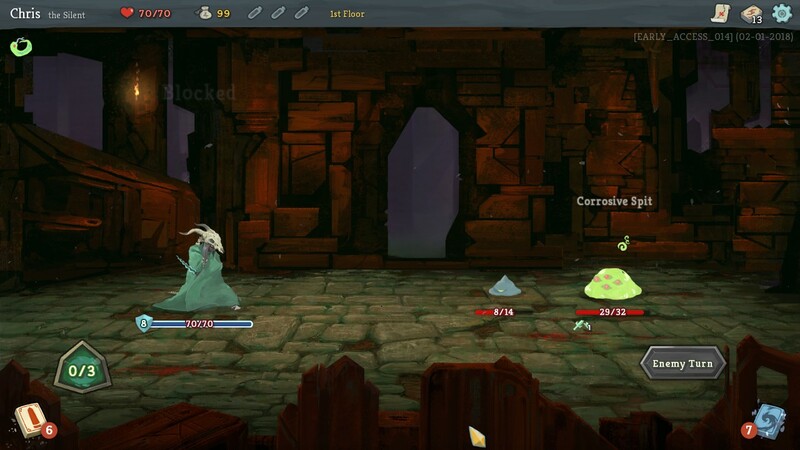 I had a relic that gave three damage everytime I gained “block”, and a relic that granted me 3 block every round, AND a relic that gave me the higher level block. 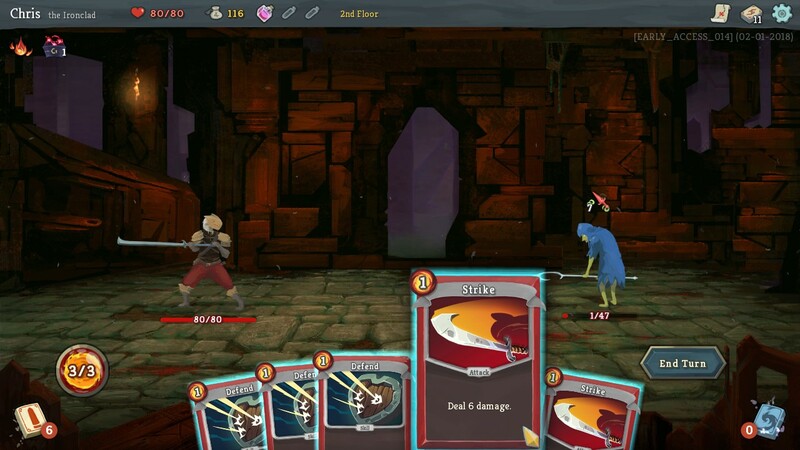 So every round before I played any card I would get high level block and damage would go out to all enemies, and a low level block and more damage. Then, any card I played that granted block would do the same – and block conditions are very common in your gameplay. That is a lot of free protection and damage. As mentioned the art style is very interesting and I am not sure if I missed an intro video or something – but the style makes me very interested in the world and what is around me. A mix of fantasy and mechanical enemies each with interesting attacks, buffs, and debuffs and solid interactions between parties of enemies. 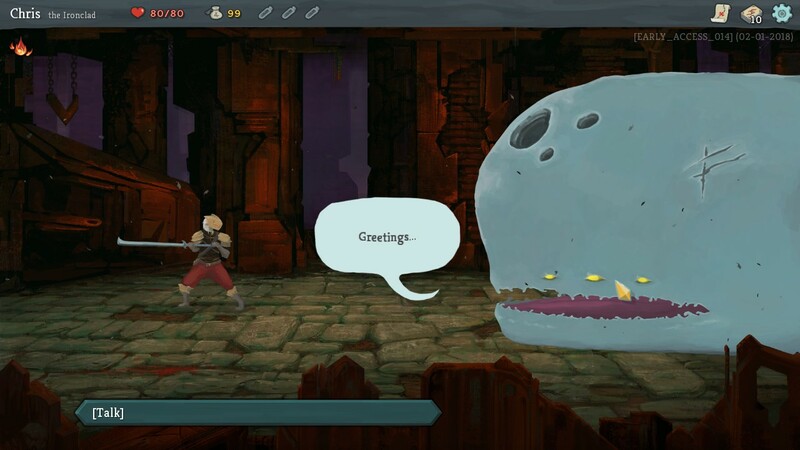 There is also a talking Whale at the beginning that gives you a reward if you had success with a boss in your prior gameplay and he mentions “back again?”, so there must be an element of reincarnation or something pushing you to attack the spire in the first place. I need to look harder at that. This is a good game and I am really enjoying it. I like the permanency of MMOs but the short adventures of climbing the spire and the differences in each journey – with tones of similarity for comfort and expanding your skill – makes for a great experience overall. I am curious if they would ever do a party mode (would be interesting) but the biggest thing I think it is lacking is that it should be mobile enabled. The graphics don’t really move (you never swing your sword, for example) and because they are very art-canvassy (ie: low poly?) simple shapes it would work well on mobile. Perhaps that is in the cards in the future as well. It’s under $15 USD and a bargain at that price.